"Sit straight!" I cannot count the number of times I say these words to a student only to get the response, "But I am sitting straight." When I first started instructing, it was perfectly clear to me as an observer whether a student sat straight or crooked in the saddle. Crookedness in a horse or a horse unwilling to turn or stay on the rail was often a dead giveaway that the rider was crooked in the saddle. However, what I SAW the rider's body doing and what the student FELT her body doing in the saddle did not match. There was a disconnect between where the rider's brain told her 'straight' was and the reality I viewed. It took a lot of observation and experimentation to figure out what was going on and how to fix it. Sitting up straight is a critical skill for riders. 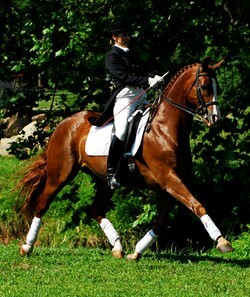 At the halt, the rider's ears, shoulders, hips and heels align when viewed from the side. The small of the back is neither arched nor rounded. Viewed from the front, the horse's neck, withers and spine form a straight line and the rider's nose, chin, breastbone, belly button align with the horse's spine. Viewed from the rear, the rider's head and spine align with the horse's spine. Most riders, however, bring poor postural habits with them when they mount up. They assume the classic 'computer posture' with chin jutting forward, shoulders slumping and lower back rounded. This posture removes weight from the seat bones. Some riders slouch off to the left or right placing their hips, shoulders, and head out of alignment. This puts more weight on one or the other seat bone, puts more weight in one or the other stirrup, puts the saddle off center on the horse, or creates any one of several other off balance scenarios. Take the example of the rider who sits over to the left with more weight on her left seat bone. At the extreme when I view this rider from in front or behind, I may see the saddle pulled off center, the left stirrup hanging lower than the right, and the rider's ribcage collapsed on the right. Her left shoulder may be higher than her right and her head may be tipped to the right so her ear points at her shoulder. Without putting my hand between her seat and the saddle, I know that she has more weight on her left seat bone than on her right. Or more weight to the left side of the horse then to the right side of the horse. When someone rides crookedly for years, that crooked position feels normal. Correcting the problem literally requires retraining their brain to understand what straight and balanced, relative to gravity, feels like. It is not easy. Riders with good body awareness (think ballet, yoga, gymnastics, any martial art) can sometimes be talked through any crookedness. I sometimes use my hands to align a rider's body so that she can feel what it feels like to be straight. But either method can have its drawbacks. If I tell a rider to drop her left shoulder, she may drop her head to the left at the same time. She feels balanced but she is not straight. If I take her knee to push her hips over so they are centered in the saddle, the rider invariably collapses her ribs on that side rather than equalizing the pressure in her seat bones. Sitting on the horse in front of a mirror or with the help of an observer, note if the horse's neck, withers and spine are straight and if the rider's nose, chin, breastbone, belly button, and spine all align with the horse's center. Correct any rider misalignment and note how the horse's alignment changes. Use the horse's alignment to help the rider see and feel what adjustments in her position straighten the horse. At the halt, stand up in the stirrups. Are they equal length? Is there equal weight in each one? Is the saddle centered over the horse's spine? Is the rider's spine centered over the horse's spine? Are the riders' hips level? Are the shoulders level? Does the rider fall forward, backward, collapse the ribcage on one side, arching her back or round her back in order to stay 'centered' over the horse? Do this in front of a mirror (or a barn window) if a ground observer is not available for feedback. If the rider tends to put more weight in one stirrup than the other, she will push her weight onto the seat bone on the weaker side. Instead of pushing weight into the stirrups, think of pressing the knees to the ground as though kneeling on the ground. This not only helps to equalize the weight in the seat bones but also helps align the heels with the hips. Have the rider sit on a swivel chair or large balance ball with her hands underneath her seat bones. The seat bones are the bottom of the bony pelvic bowl. The bony projections we call our 'hip bones' are actually the top of this bowl. The actual hip joints are located in the bend between the upper body and thighs where the balls at the top of the thigh bones fit into the sockets of the pelvis. Keeping shoulders, ribcage and hips as level as possible, move weight from one seat bone to the other. Note what a small movement of the hips is required to do this. Shift weight forward and back without arching or rounding the lower back. Keeping the hips as level as possible and the shoulders over the hips, put the seat bones at a slight diagonal and shift weight from one to the other. Play with these movements with the chair facing forward, then swiveling right or left as though turning. These are the subtle movements that a horse feels and responds to. Retrain the brain. Right-handed riders should do everyday things with their left hand, vice versa for lefties. Do exercises that make the arms or legs or both cross the body's midline to help balance the brain's signals to both sides of the body. Strengthen the weaker side and stretch the stronger side of your body. Trust and use the horse's feedback. Riding on the buckle, make a left turn, a right turn, circles, a serpentine, a half turn on the haunches and observe the horse's answers to requests from the seat bones. If the responses are not what the rider thought she was asking the horse to do, she can experiment with changes in how she centers herself and weights her seat bones. Her horse will tell her when she gets it right. Temporarily ride with the stirrup longer on your stronger side or shorter on your weaker side. If possible, ride without stirrups on a quiet horse. Focus on keeping your shoulders over your hips and your hips centered over your horse's spine. Note, this may feel uneven or unbalanced to someone who has been riding crooked for a long time. The only way to give the horse clear, meaningful communication is to start by 'sitting straight' then using strong but flexible core muscles to weight and unweight the seat bones for directional guidance and speed control. This is the 'independent seat' that a rider must achieve in order to truly influence the horse. Without it, the rider is still influencing the horse. But until she develops a true feel for 'straight' in her own body and in the horse's body, communication with the horse will be unclear, inconsistent, or, worse still, incorrect.